how are disaster survivors affected by social response globally? After analysing the data sets from Characterization of Social Media Response to Natural Disasters by S. Nagar/A. Seth/A. Joshi which explores the response of the Typhoon Philippines, Brazil Flood and Japan Earthquake we can outline the focus and concentration of each interconnecting post revolving around the disaster. Discussion of what could be described as the snowball affect presented the idea of small, sharing and responding within a disaster time period exist firstly with little connection to the main idea; the natural disaster itself. However over a short time a combination of these small ideas develop into large, trending nodes which according to this particular study took up over 90% of twitters activity . Theoretically based on Table 1: DataSets majority of the 3255 users from the 19th to 21st of October (2010) would have seen one or more of the 5500 tweets revolving around the disaster. When Japan was struck with a large Earthquake/Tsunami in March 2011 analyse of the locations in which people posting were from is seen clearly in Figure 8. 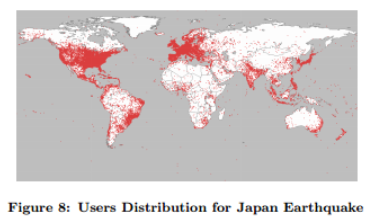 Out of 2, 006, 655 users on twitter during that time period 1, 302, 787 users had valid locations and from that Figure 8 was constructed to show the total distribution of the posts made about the Japan Earthquake. Larger populated areas within more economically developed countries/continents such as North America, Brazil, majority of Europe and parts of Australia, India and obviously Japan have a large response on the event. China is an exception to this pattern, despite being economically developed users within China don’t actively participate in the spread of support on the Japan Earthquake as much as North America, etc. Social Media and Technological response worldwide to a natural disaster, is a factor that impacts the people affected by the disaster that has occurred or is going to occur. The use and harnessing of social media is still yet to hit its peak, in both outside response and action and that of the natural disaster survivors but is still a very important aspect of wellbeing and support for all involved in a disaster. At the moment 25% of survivors and people who live in disaster prone areas have downloaded a disaster-related app and another 18% retrieve emergency information through Facebook. For people utilising the internet to be prepared they have a better chance of fleeing from a particular disaster warned to come. Unfortunately not all countries or regions have access to internet in the world at the moment making it difficult for inhabitants to utilise one of the earliest forms of warning and to communicate globally after an event. Survivors also rely on internet to contact either direct emergency services for help or information or survivors post a general help message/post on any social media sites. 1 in 5 survivors contact emergency responders via social media, websites or email whether they could physically get to the organisations aid position or not. Requesting help on a responders Facebook page has risen to 35% of the affected, 1/3 of survivors are told to expect help within 60 minutes of posting or earlier. Lack of information on the extent of an event, location of loved ones and warning of an incoming natural hazards can directly affect anyone involved in a disaster hit area psychologically and ultimately their overall well being. Access and knowledge of aiding organisations can also support survivors psychological state and alleviate some stress and concern that pairs itself with any disaster and may prove to open an escape route or give them aid physically as well as access to necessities for living. For survivors internet and alternate means of communicating can mean life or death or could more simply assist in their health; mental and physical. 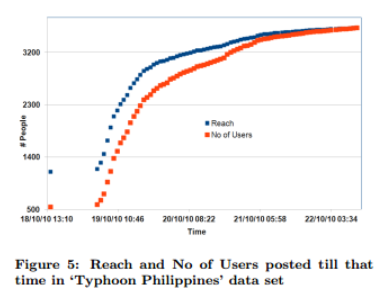 Every twitter user on the 22nd of October 2010 viewed a post or was notified about the Philippines Typhoon in some form according to the reach data in Figure 5. The coverage of reach over the users gradually increases over the 3 days of tweets. Similarly discussed in previous paragraphs, survivors make up a large portion of those tweeting however the impact of this whole process on a survivor is not just based on their own usage of social media but also of the response from others not caught in the disaster and their contribution and support and update posts on the event. Survivors do not need to feel alone and abandoned when they can see the support of people from countries from every part of the globe, emotional and mental support is given for this survivors additionally boosting their overall happiness. When an event/disaster is trending it reaches a large majority of people on the social media site, often users see sponsored ads to donate or to volunteer pop up in their news feed. The greatest aspect of social media is not the fact it can reach millions of people but that the response to one help post can reach millions of people and somehow reach someone who has the authority to make something happen. An example of this would be that in a hospital in Japan a hospital staffer twittered to U.s Ambassador John Roos about the 80 patients only 27 miles from the Fukushima nuclear plant who were in danger. Roos was able to coordinate an evacuation for those patients who were going to be caught in the nuclear fallout. Lives can be saved from one post, one tweet, people were saved by that twitter message and the basic human instinct to want to save another person. 84% of ALL Facebook status updates included the words Japan, Tsunami or Earthquake on the 11th of March, 2011 that is the extent of the concern globally surrounding Japan tragedy.